(1963) "What'cha Gonna Do About It"
"Just One Look" is a song co-written by American R&B singers Doris Troy and Gregory Carroll. The recording by Doris Troy was a hit in 1963. The Hollies, Anne Murray and Linda Ronstadt recorded hit versions of their own. There have also been many other versions of this song. Details vary as to how the Doris Troy version came to be released on Atlantic Records. According to the book Billboard Book of One-Hit Wonders, James Brown saw Troy performing in a nightclub (under her then-stage name Doris Payne), and introduced her to Atlantic. According to a more recent and detailed story in Soulful Divas, Payne recorded a studio demo of the song and took it to Sue Records first, but their lack of response led her to offer it to Jerry Wexler at Atlantic, where the label released the demo unchanged. The personnel on this song included Ernie Hayes on piano, Wally Richardson on guitar, Bob Bushnell on bass and Bernard Purdie on drums. The single's release was the first time she started using "Doris Troy" as her stage name, though her pen name remained Doris Payne. The album also lists the surname Payne in the songwriting credits. In 1963, Doris Troy scored her only hit on the U.S. Billboard Hot 100 chart with "Just One Look". The song spent 14 weeks on the Billboard Hot 100, peaking at No. 10, while reaching No. 3 on Billboard's Hot R&B Singles chart, No. 8 on New Zealand's "Lever Hit Parade", and No. 1 on Canada's CHUM Hit Parade. The song also charted at No. 9 on the Cash Box Top 100, in a tandem ranking with the version by Andy and the Marglows, with Troy's version marked as a bestseller. The song was ranked No. 70 on Billboard's end of year ranking "Top Records of 1963", while being ranked No. 80 on Cash Box's "Top 100 Chart Hits of 1963", and No. 11 on Billboard's "Top R&B Singles for 1963". Doris Troy's version of the song was featured in a 1991 Pepsi commercial starring Cindy Crawford, which was reaired during Super Bowl XXXV in 2001. An updated version of the ad, still featuring Cindy Crawford and Troy's version of the song aired in 2002. In 2015, Troy's version of the song was featured in an ad for Aspartame Free Diet Pepsi. The song was also used in a series of commercials for Mazda beginning in 1979 and continuing into the early 1980s, using a different version recorded for the ads. 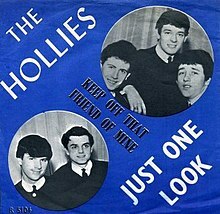 "Keep Off That Friend of Mine"
(1964) "Here I Go Again"
"Just One Look" became a hit in the United Kingdom via a cover version by the Hollies which reached No. 2 on the Record Retailer chart in April 1964. It became the 37th biggest hit of the year. Although not a major U.S. hit in its original release, the Hollies' "Just One Look" marked the first appearance of the Hollies on the Billboard Hot 100 at No. 98. A U.S. re-issue in 1967 reached No. 44 on the Billboard Hot 100. Anne Murray remade "Just One Look" for her 1974 Love Song album. The track was produced by Brian Ahern and issued as a single that October. Her cover reached No. 11 on Canada's RPM Top Singles chart, No. 12 on Canada's CHUM 30, and spent two weeks on the U.S. Billboard Hot 100, reaching No. 86. It also reached No. 50 on Billboard's Easy Listening chart. The song's B-side, "Son of a Rotten Gambler", reached No. 1 on RPM's Adult Contemporary chart and No. 3 on RPM's Country chart in 1974. Linda Ronstadt remade "Just One Look" for her 1978 album Living in the USA. Her cover of the song was issued on Asylum Records as the album's third single on January 23, 1979 and was produced by Peter Asher. Ronstadt's single spent eight weeks on the Billboard Hot 100, reaching No. 44, while reaching No. 5 on Billboard's Easy Listening chart. It also peaked at No. 46 on the Cash Box Top 100 and No. 54 on the Record World Singles chart. American Motown girlgroup Martha and the Vandellas recorded the song for their 1963 album Heat Wave. British singer Lulu recorded the song in 1965 for Decca Records. The Tampa, Florida based disco band Faith Hope and Charity released a cover of the song, which spent four weeks on the UK Singles Chart, reaching No. 38 on February 7, 1976. Doris Troy released a disco song "Another Look," produced and arranged by John Davis, with most of the lyrics intact but substantial changes to the melody and structure, but credited to the original writers. It was released as the B-side of "Can't Hold On" on a Midsong International records 12" single (MD-11083) in 1977. Lynda Carter covered the song on her album Portrait in 1978. Michelle Phillips covered the song on her album, Victim of Romance (1977). ^ Jancik, Wayne, Billboard Book of One-Hit Wonders, revised and expanded, Billboard Books, 1998. ^ Nathan, David, Soulful Divas, Billboard Books, 1998. ^ Bernard "Pretty" Purdie, Let The Drums Speak!, 2014 pages 69-70. ^ a b "Hot R&B Singles", Billboard, August 24, 1963. p. 22. Accessed December 22, 2015. ^ a b "Lever Hit Parade" 28-May-1964, Flavour of New Zealand. Accessed December 24, 2015. ^ a b "CHUM Hit Parade – Week of August 12, 1963". Archived from the original on November 7, 2006. Retrieved 2015-12-24. CS1 maint: BOT: original-url status unknown (link) Chart No. 335. CHUM. ^ a b "Cash Box Top 100", Cash Box, August 3, 1963. p. 4. Retrieved April 19, 2017. ^ "Top Records of 1963", Billboard, Section II, December 28, 1963. p. 31. Retrieved February 17, 2018. ^ a b "Top 100 Chart Hits of 1963", Cash Box, December 28, 1963. p. 20. Retrieved April 18, 2017. ^ "Top R&B Singles for 1963", Billboard, Section II, December 28, 1963. p. 31. Retrieved February 17, 2018. ^ "Merchants & Marketing", Billboard, May 19, 2001. p. 67. Accessed December 23, 2015. ^ Walker, Rob; "Ad Report Card: Cindy Crawford Still Drinks Pepsi", Slate, April 8, 2002. Accessed December 23, 2015. ^ "Top 100 1964 – UK Music Charts". Uk-charts.top-source.info. Retrieved 2016-09-27. ^ a b Hot 100 – The Hollies Just One Look Chart History, Billboard.com. Retrieved March 5, 2018. ^ "Hits of the World", Billboard, May 9, 1964. p. 30. Accessed December 23, 2015. ^ "Lever Hit Parade" 21-May-1964, Flavour of New Zealand. Accessed December 24, 2015. ^ "The RPM 100", RPM Weekly, Volume 8, No. 11, November 11, 1967. Accessed December 23, 2015. ^ "RPM Top Singles", RPM Weekly, Volume 22, No. 16, December 07, 1974. Accessed December 23, 2015. ^ "Chart Number 931 – Saturday, November 23, 1974". Archived from the original on February 13, 2006. Retrieved 2015-12-24. CHUM. ^ Hot 100 – Anne Murray Just One Look Chart History, Billboard.com. Retrieved March 5, 2018. ^ Adult Contemporary – Anne Murray Just One Look Chart History, Billboard.com. Retrieved March 5, 2018. ^ "Easy Listening", Billboard, November 30, 1974. p. 30. Retrieved March 5, 2018. ^ "RPM Pop Music Playlist", RPM Weekly, Volume 22, No. 10, October 26, 1974. Accessed December 23, 2015. ^ "RPM Country Playlist", RPM Weekly, Volume 22, No. 17, December 14, 1974. Retrieved March 5, 2018. ^ a b Hot 100 – Linda Ronstadt Just One Look Chart History, Billboard.com. Retrieved March 6, 2018. ^ a b Adult Contemporary – Linda Ronstadt Just One Look Chart History, Billboard.com. Retrieved March 6, 2018. ^ "Easy Listening", Billboard, March 24, 1979. p. 75. Accessed December 23, 2015. ^ a b Cash Box Top 100 Singles, Cash Box, March 31, 1979. p. 4. Accessed July 14, 2016. ^ a b "Record World Singles", Record World, March 24, 1979. p. 37. Retrieved March 5, 2018. ^ Steffen Hung. "Forum – 1970 (ARIA Charts: Special Occasion Charts)". Australian-charts.com. Archived from the original on 2016-06-02. Retrieved 2016-09-27. ^ "RPM 100 Singles", RPM Weekly, Volume 31, No. 3, April 14, 1979. Accessed December 23, 2015. ^ "RPM Adult Oriented Playlist", RPM Weekly, Volume 31, No. 7, May 12, 1979. Accessed December 23, 2015. ^ "1979 Year End". Bullfrogspond.com. Retrieved 2016-09-27. ^ Martha & the Vandellas – Just One Look, norwegiancharts.com. Retrieved April 18, 2017. ^ Faith, Hope and Charity – Full Official Chart History, Official Charts Company. Retrieved March 14, 2018. ^ Roberts, David (2006). British Hit Singles & Albums (19th ed.). London: Guinness World Records Limited. p. 193. ISBN 1-904994-10-5. ^ "Portrait – Lynda Carter". AllMusic. Retrieved April 22, 2018. "Long Cool Woman in a Black Dress"
"Sandy (4th July, Asbury Park)"
"How Do I Make You"
This page was last edited on 12 February 2019, at 07:23 (UTC).